Rookie quarterback Dak Prescott has been simply sublime this year, leading the Cowboys to 12 wins in 14 regular season games. Dallas are on the verge of clinching a first-round bye and home advantage through the playoffs and Romo could take to the field for the Week 17 clash against the Philadelphia Eagles if all goes to plan. While running back and fourth overall pick Ezekiel Elliott has received the bulk of attention for his record-breaking year, Prescott has kept himself to himself and has quietly gone about his business and deserves similar levels of recognition. 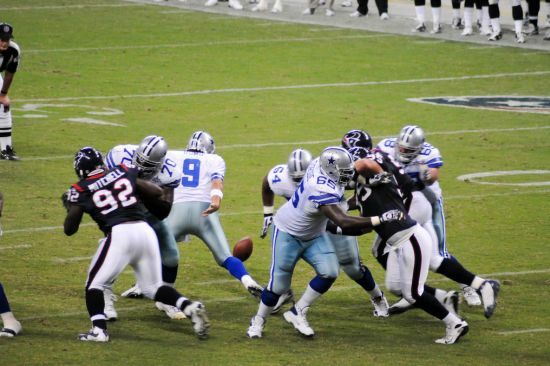 The Dallas starlet has completed 292 passes for 3,418 yards – throwing 20 touchdowns and just four interceptions. Prescott has also been productive on the ground, averaging 4.6 yards per carry and notching six scores; one more than Los Angeles Rams star running back Todd Gurley. Prescott’s emergence has got NFL fans whispering about Romo’s future at AT&T Stadium – and with good reason. The youngster, selected in the fourth round of this year’s NFL Draft, is on a cheap rookie contract whilst Romo is on a lucrative deal; and this could tempt Dallas to consider shipping the Dallas veteran out whilst he is still useful. Romo has always been a solid option at the quarterback position but he has never managed to breakout as an elite star in the NFL; Prescott can be that guy if Dallas stick by him – and that will come at Romo’s expense. In addition, the National Football League landscape is changing and versatility under center is now integral to most professional schemes. Traditionally, college football franchises have used quarterback reads on a regular basis but there are now more mobile options at the position than ever before. The likes of Cam Newton, Tyrod Taylor and Alex Smith are all capable of rushing to move the chains and the days of “pocket passer” Peyton Manning are now all but over. Romo has produced clutch moments in the past but he has never managed to lead this Dallas side like Prescott can. As of December 22nd, the Cowboys are looking like serious Super Bowl contenders and NFL fans will be backing Dallas, valued at 5/1 with Betway, to go all the way to the showpiece event in Houston. In Prescott and Elliott, Jason Garrett has two immense young stars and the Cowboys should continue to keep faith and trust in both players. They have already proven their worth on more than one occasion this season. Two season-ending injuries in the last couple of years have affected Romo’s ability to keep plugging away and competing at the top. In 2015, it was a collarbone issue and now it is his back. Eventually, these problems will catch up with him and Dallas cannot afford to place their entire faith in a potential casualty when they have a competent, young option to lead the Cowboys organisation for the next decade or so. Romo’s career-high stat line came way back in 2014 (34:9 touchdown to interception ratio, 69.9% pass completion rate and a 113.2 passer rating) and it is hard to imagine that he will ever hit those heights again. All of these trends are negative, but that doesn’t mean that Romo cannot go to somebody like the San Francisco 49ers or Cleveland Browns and do a solid job. But it would be fair to claim that his time in Dallas is coming to an end. – whether the Cowboys can get a decent offer for his services or not is another question. If nothing else, it is sure to be a very interesting few months for Tony Romo and his supporters.